← Mormon Cake: Sunday March 1st, 2015. June sees through me like an airport’s full body scanner. “She’s salt Kool-Aid.” She says, turning to find our new friend in the cafeteria. Grace, her class let out late for lunch, stands with her arms crossed at the back of the lunch line. Hearing me grip about Morgan’s technical virginity has sent her in the opposite direction, and she’s become more conservative than ever. Her skirts have gone ankle length and somewhere she’s found a sweater vest and yellow rubber WWJD? bracelet to wear. She has the homey glow of a women either pregnant or absolutely content with herself. That may be the problem for June. Grace moves farther up the line, taking a tray and sidestepping her way to the entrées. She points to the spaghetti and a large black woman in a hairnet and stained white apron scoops a huge helping onto her tray, topping it with a roll before motioning her on. And I am thinking about it. I was eight or nine when a neighborhood girl named Holly Byrd chased a crying Oliver into our yard, saying he stole her kickball or something. Somehow a hoe appeared in my hand, and I told her to apologize or else. She gave a high, nasally laugh, her small, upturned nose showing buggers. I struck her across the face with the sharp end and she fell to the ground screaming, her hands covering a gash in her cheek you could see teeth through. I cried myself to sleep for a week after that. “It wasn’t much of a fight.” I whisper, wondering if Oliver really did steal Holly’s kickball. “Hey.” Grace smiles and sits beside me, centering her tray squarely on the table and automatically placing her roll and fruit cup in front of June. June eyes her and turns away. Grace looks at me and I translate the vulgarities the best that I can, adding, almost as an afterthought, that June has a toothache. Grace looks more confused than hurt. I half expect her to offer June a Midol. Maybe three. “I don’t read that much of it.” I say, suddenly, inexplicably self-conscious. For the past three weeks I thought I’d hidden my growing admiration of Michael Crichton and secret love affair with Charles Stross from all but Grace. I suppose not. “You’re reading to much.” June mumbles, eyes closed. Her tongue works around her mouth, poking here and there as if searching for a lost quarter. The few afternoons we’ve spent in Grace’s house- a nice two story colonial just outside the upscale subdivision of Pine View- were used pouring over hundreds of paperback, trade paperback and hard cover Science Fiction books. Some were bought retail, while most came in large cardboard boxes marked “Donation”, “Clearance” and “Keep For Bird Cage.” In my room I’ve collected a small pile of my favorites (the afore mentioned Crichton and Stross) hoping Grace will forget she lent them to me. 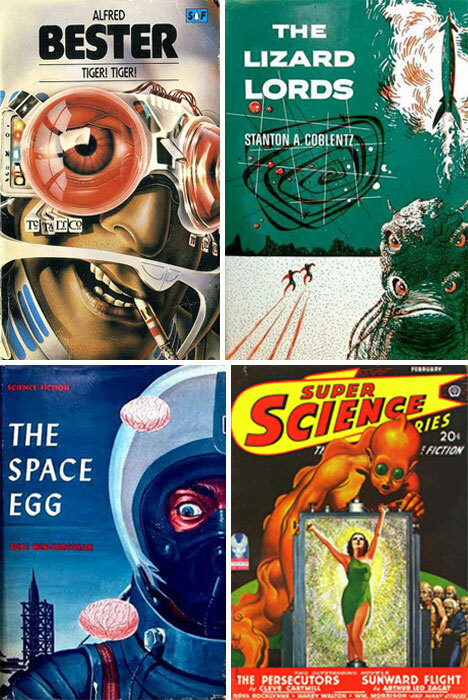 Not all Science Fiction is bad, just most of it. June looks at me. Is that a flash of green in those Mexican eyes? Are you jealous? The moment passes as June is submerged under a fresh wave of pain. She rubs her cheek, her mouth undulating open and closed like a fish yanked onto a river bank and left gasping. Slowly and with eyes closed, unsure what the outcome will be, she bits down. There is a small, wet, crunch like someone stepping on a robin’s egg. She opens her eyes. Tiny tears have formed in their corners. “Are you ok?” Grace asks, her voice shuddering. This is one of the few moments in her life that June P. Rodriguez has received genuine concern from anyone. June starts at the beginning, and Grace shrinks back when she hears Deshawn Cannon is black. “It’s just him. He doesn’t have any friends. And he’s just a little guy.” I attempt to reassure her and perhaps myself that the black stereotypes are just that, stereotypes, that nobody’s going to get raped or murdered here. “He’s even smaller than Sunny.” My laugh is unconvincing and Grace turns to June for reassurance. “I’ll take care of it. You just have to show up.” June forces a smile, one that says I‘m sorry about making fun of your s**** books, A Clockwork Orange was a good piece of social satire. Grace gives a nervous, forgiving grin. I’ll be there, it seems to say. Her fingers though, are tangled around the WWJD? bracelet, unsure of anything. This entry was posted in American Angst: Journal, Home and tagged art, bullying, Christianity, diary, friendship, Journal, teenager. Bookmark the permalink.